Ibi Zoboi’s debut opens with young Fabiola traveling from Haiti to Detroit with her mother; officially entering the US for a visit, their plan is really to remain, moving in with Fabiola’s mother’s sister to start a new life. It’s a version of the American Dream that resonates throughout the novel, as Fabiola tries to acclimatise to the very different way of life of her cousins, while her mother remains in a detention center with no immediate prospect of going anywhere. While Fabiola was born in the US, she has lived her whole life in Haiti and, suddenly removed from her home and forcibly separated from her mother, she finds herself rudderless. The whole house seems to want to squeeze me in, force a deep wail from out of my body because it’s only been one day and I am losing myself to this new place. This is the opposite of the earthquake, where things were falling apart and the ground was shifting beneath my small feet. Here, the walls, the air, the buildings, the people all seem to have already fallen. And there is nothing left to do but to shrink and squeeze until everything has turned to dust and disappeared. I was intrigued by Zoboi’s very topical premise, particularly in terms of whether Fabiola and her mother would be reunited and if they’d have to return to Haiti for that to happen. This wasn’t, however, as significant a feature of the book as I’d imagined, with the bulk of the narrative focusing on Fabiola trying to fit in with her cousins and their life in Detroit. The narrative is very focused on Fabiola’s present, but there is the occasional allusion to her life back in Haiti; it soon becomes apparent that life in the US is no less fraught. Identity is a key theme of American Street, with Fabiola forced to question her appearance and her values; a dramatic makeover isn’t exactly a rare occurrence in teen fiction, but Fabiola’s here is of a cultural as much as an aesthetic nature, and her ambivalent attitude to her new appearance and the expectations placed on her adds intriguing tension to the novel. I did find myself feeling a little frustrated with her, mainly as a result of the inevitable romance subplot; Fabiola, of course, finds herself an inappropriate boyfriend and my motherly instincts prevented me from seeing this as in any way a good idea. Death parked itself on that corner of American and Joy, some days as still as stone, other days singing cautionary songs and delivering telltale riddles, waiting for the day when one girl would ask to open the gates to the other side. What I liked most about American Street, oddly, were the periodic diversions from the main narrative, as the history of Fabiola’s aunt’s house is recounted, symbolically referencing the immigrant experience on a wider scale. There’s a real poetry to these interludes, with the darkness and violence of the modern-day setting translated into something mythical and both grand and intimate. If there’s a more topical and resonant book than American Street to read while President Trump’s travel ban controversy rumbles on, I’ve not encountered it. 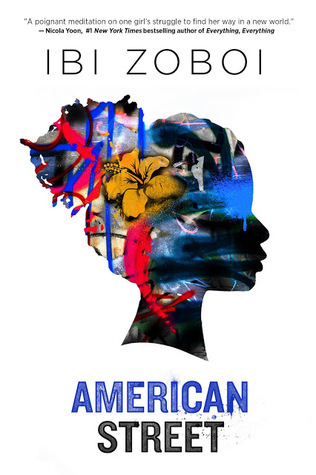 It’s probably unrealistic to expect a YA novel to tackle politics in immense detail, and, while I would have liked to see Fabiola’s mother’s detention explored in more depth, the drama of Fabiola’s new life in Detroit is certainly absorbing.